I love this time of year when the first fruits and vegetables start popping up at local farmers markets. I am always on the lookout for good zucchini because I absolutely love zucchini bread. I have tried so many recipes and none of them created the perfect bread that I was looking for, that is until I came across this Paula Dean recipe. It creates the perfect bread that is moist and flavorful without being overpowering. I added mini chocolate chips to the bread because, well, I add chocolate chips to everything! Preheat your oven to 350 degrees. In a large bowl, mix the dry ingredients and set aside. In another bowl, mix the wet ingredients until just combined. Finally, mix the wet ingredients into the dry and stir until moist. Add the chocolate chips or nuts if you are using them. Spray 2 average sized loaf pans with cooking spray. I recommend using cooking spray instead of butter for greasing with this recipe. The loaves seem to come out of the pan much better with the spray. Divide the batter evenly among the 2 pans. Bake for about one hour or until firm in the middle. I often freeze the second loaf when I made this recipe, it tastes great even thawed out of the freezer. I’ll have to make this when our zucchini are ready. Zucchini bread was about the only thing I didn’t make with zucchini last year. I was planning to make banana bread this weekend, but I think I’m going to switch gears and try this recipe! 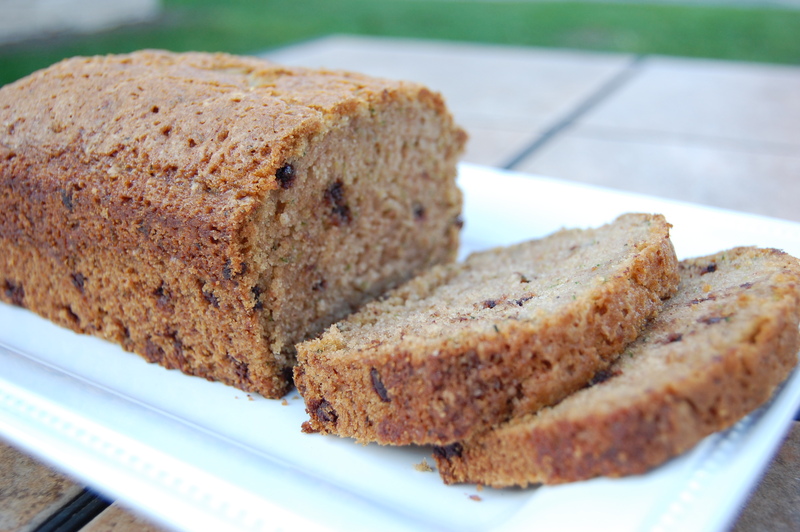 Or maybe make up a new zucchini banana bread (I don’t know, is that gross?)! @Emily – you should try it! I bet it would be good. I put zucchini in an apple pie once and it was definitely not gross. I want to hear how it turns out! Made this and am sending a loaf to my Grandparents, I am sure they will enjoy it!